(map) We have gotten a lot of questions about this place, so we’re re-running the story. 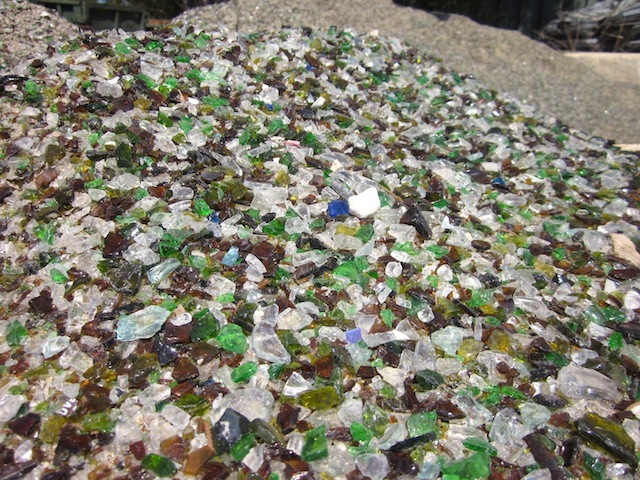 Garden-Ville sells all kinds of organic soils, compost and mulch, but the most striking is this Glass Rock. Folks find all kinds of creative ways to use this sparkly stuff at home, such as pathways, a zen garden, or even lining the bottom of koi ponds. 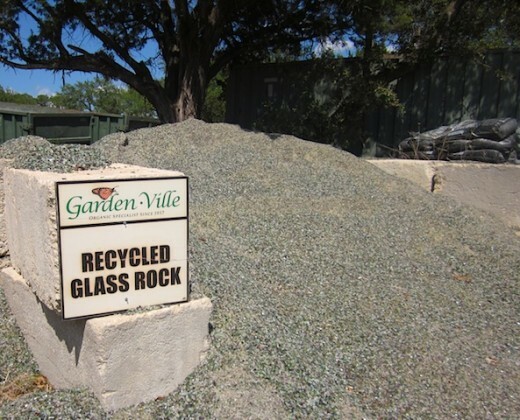 Garden-Ville takes the entire city of Austin’s recycled glass, then tumbles it smooth so it’s safe to handle. This stuff inspired the Annie Lennox song, “Walking on Broken Glass.” Kidding. You can get a cubic yard (about the size of a pickup bed) of it for $24.99, or a 40-lb bag for just $3.99. Don’t want to get your hands dirty? They also deliver. 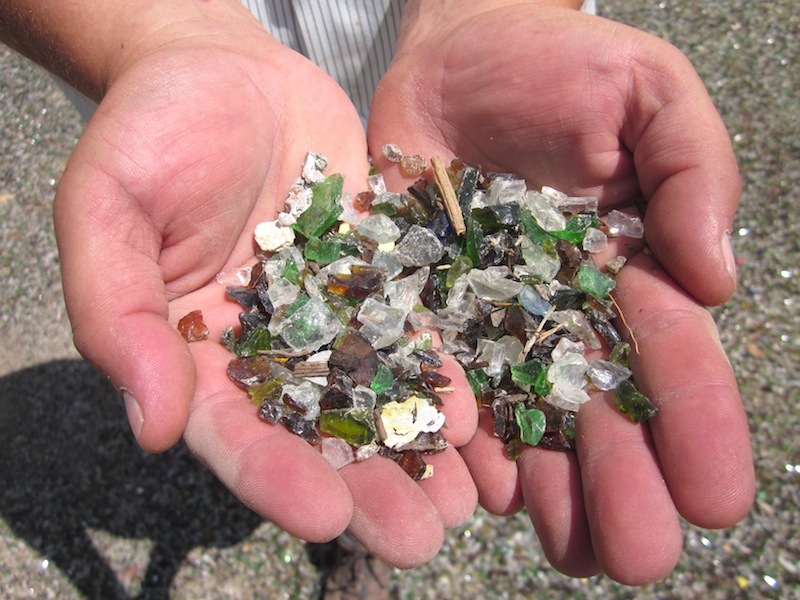 City of Austin no longer offers free glass mulch. Ed. Reply: Thanks! Good to know. But Eco Depot is not affiliated with the City of Austin; they are part of Texas Disposal Systems. They still sell glass mulch from the facility in Bee Cave. That stuff is worth a trip to Austin! I already have visions of using it as gravel between the pavers on my patio. Ed. Reply: Good idea! Just note the place is in Bee Cave, not A-town. I’m thinking of using this glass rock to line my driveway. Is it safe to drive on without the tires getting punctured? Ed. Reply: Yes! You can hold it in your hands, walk on it, drive on it. It’s been tumbled to be smooth. Sure wish I had called before I left my house to see if this place was open. I drove 20-25 miles to get to the Georgetown location only to find the gate locked shut. If you aren’t going to stay open until your posted hours, please leave a message on your answering machine saying so. I spent about $7-8 on gas for nothing. So, thanks alot. I will not be returning to give you my business in the future. Ed. Reply: Sorry to hear that! It’s not our business; we just reviewed it. The Bee Cave location has been pretty reliable. David – I’m so sorry to hear the store was not open. Would you please email me with information about when that happened so I may speak with the store and ensure they are open according to the listed hours? Can you get it in certain colors? Ed. Reply: It comes in that assortment of colors – brown, green, clear – but you can’t get one specific color. 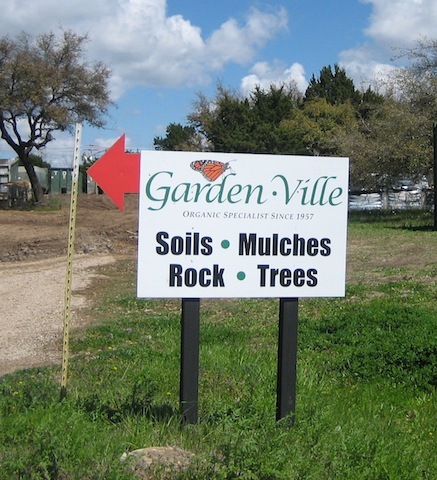 Wow- very disappointing customer service at Garden-ville. I was very excited about what they had to offer and after 2 days of trying to call, i got someone at the corporate office, hoping they could guide me to the right store- none of which are ‘on my way’.. the gal wired me back to the original store and then when she got me for the second time, was very short and did the same thing. The next time i called it actually hung up. Every time i called after that, i’d get wired to the corporate office and she would not answer.. hmmm. Ed. Reply: Sorry to hear that! We use the location in Bee Cave and they have been super-helpful. I wonder if you should tell the corporate office about it. I called corporate once trying to locate red wriggler worms for a “worm farm,” and they did all kinds of research for me. Don’t let one rude person put you off the place, they have great products! The city’s tumbler broke. So now they give the glass YOU recycle and they sell you your glass. To sum it up you give it, the city gives it and then its sold back to you. I’m sure the tumblers cost a lot but when they pay for them will they give it away, or keep selling it for a profit? The glass is free to them. Your tax dollars at work. But I do have some that I got from the city and it dose look great in my flower beds.